I can’t fault Dave Hodges on this view. Hodges has done his homework. After all, how many times on this forum have I categorically stated that I believe “Pence is to Trump as LBJ was to John F. Kennedy”? Excerpt below to start you off. See the link for the full Monte. “He was totally for the TPP. 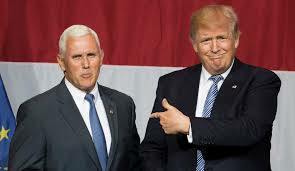 He is my modern day version of LBJ..” Pence was for Obamacare.. Now we know that Pence actually created a PAC to run for President in 2020. What has Pence been promised? This is the leaker of the Op-ed for the NYT. Somebody should ask Pence what goes on in certain tunnels below certain farms in Indiana. The New York Times Op-ed is one of the most disgusting displays of cowardice on the part of a so-called journalistic enterprise. Op-ed’s are not anonymous. To the author of the Op-ed, you are a coward and a traitor. As an American who expects Trump administration members to work towards the betterment of the country and not focus on the plotting the demise of the President, this display borders on treason on the level of Benedict Arnold. The author(s) needs to be put in prison. IF it was Pence, he totally outed himself. So what was the point of that? Maybe you can tell me the point, so I can not read/listen? LOL. Not for nothing, but remember the message the Generals gave Lindsey? for those who would think to sabotage. Why didn't he just put a bullseye on his chest? Or go buy his own ticket to Gitmo like a good public servant? Would we know what happened to no name and Pence would not? If he knows, but he's a Rino, then he's already been completely castrated and is just there because it would be too disruptive right now to get rid of him. I'd sure go to the Team and ask for help before I'd ever choose to cross them. Uhhhh, you did see that Elizabeth 'Pocahontas' Warren has started the evoking of the 25th amendment, right? This is all happening right about the same time as the NYT article. He has everything to gain. Just connecting dots here. May or may not be something to it. Regardless I still stand by my Pence/Trump = LBJ/JFK view. I've never trusted Pence. Too bad that. I would like to think such a thing originated from a student essay and not from Pence, who I've never trusted. I called it and was correct, and to cause Trump to doubt his base. Scroll down the page a ways, my post on this topic is there. The treason piece was submitted as part of a college essay by a USC student on September 5th. It did not originate within the white house. The MSM figured it sounded good so they published it to sow discord within the Trump administration, and attempt to get Trump to self-destruct the white house. Here is the entire tweet stream and it is important to actually click in, because this twitter feed actually goes through the steps, and shows how it comes up as a submission by a college student as part of an essay. I was not the only one questioning whether or not the letter was legit I guess. 2. I believe most Americans have witnessed the major print and media outlets act in such increasingly egregious manners that with each successive act of media malfeasance we've become a bit inoculated against our justified outrage. 3. The New York Times printed an opinion piece from a supposed mole within the Trump Administration today. Put aside that it is patently fake news for a moment. Whether it is true or not (it isn't), is not the most important issue at hand. 4. The issue at hand is that the New York Times is either willing to aid and abet a clearly seditious person within the administration, or by publishing such a false story, they've committed an act of sedition themselves. 5. Today they crossed the Rubicon. They are either hiding the identity of an individual who wishes to overthrow the current administration, or they are attempting to do it themselves by publishing the story they did today. 6. Either way, they have very clearly committed unlawful actions and should be held accountable for them. At best, they were duped by a "journalist" into publishing fake news, or they are abetting seditious, treasonous individuals." My comment so the NYT dug up a college essay within minutes of it hitting the college archives and becoming searchable, and published it with a fake back story to cause the Trump administration to implode on itself. That's quite a psych war tactic. I'm not trying to be difficult, or poop on DH, even tho I rarely agree with him. I don't doubt Pence was on the wrong side. I had heard he was 'forced' on DJT, and was not the man he wanted. Once Pence got there maybe he was given a conditional opportunity, maybe not. We'll find out eventually, I think. I did read the 'student story' yesterday, and all the Q warnings of a new level of push back, which follows the pattern we've witnessed. And this article comes on the heels of the Woodward book, last weeks coordinated newspaper attack against POTUS, etc. They just keep coming. Like you, I read a ton that I don't post, so often I've already formed an opinion. And I post that, whether it agrees or not with DH's pov. And I'm always ready to change as new facts come to light. I'll try to think of a better way to present the views that differ from DH's, maybe? Or not say anything? It's too time consuming to go back for links. I'm fine with whatever works for the forum. Aaaaaaand now we have this. I just report what I find, you decide. DISCERN as always. Video is 9½ minutes in length. SCOOP! The person who wrote the OpEd contacted me for an interview! The failing New York Tiimes Published an OpEd allegedly written by a Trump Admin official, and they claimed that this anonymous source is giving insider intel about a resistance inside the White House.